With the depot as a backdrop, a steam rotary snowplow clears a yard track. Large spinning fan blades pickup snow and propel it to one side of the track or the other. The direction of throw was controlled by the direction of the fan's rotation, which was controlled by the rotary's engineer. The engineer also controlled the speed of the fan and regulated the amount of power applied. 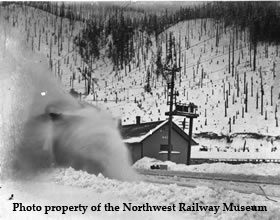 A steam rotary snowplow kicks up some snow near the coaling tower in Wellington (Tye). The steam power plant is visible right behind the rotary and was used to provide steam for heating throughout town. 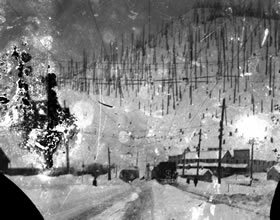 A rotary was not self-propelled and required one or more locomotives to push it into the snow it was designed to clear. 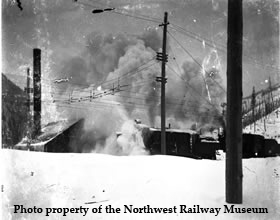 A steam rotary snowplow pushed by a steam locomotive stirs up the snow in Wellington (Tye) near the depot. Note the unique catenary with two conductors per track to accommodate the three phase electric locomotives. A Jordan spreader and a steam rotary snowplow clear tracks in Wellington. Jordan spreaders have plows on the side that allow the accumulated snow to be pushed back from the tracks. A steam rotary and a Jordan Spreader clear tracks in Wellington just west of the depot. 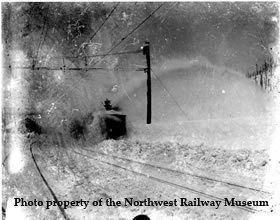 A steam rotary snowplow clears track in Wellington and displays a spectacular rooster tail. 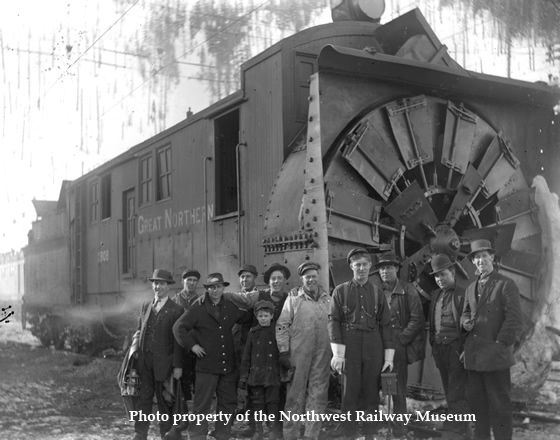 Locomotive and plow crews pose with steam rotary snow plow X-808. 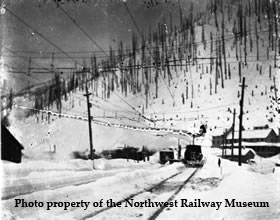 Note the electric locomotives on the next track behind the plow. 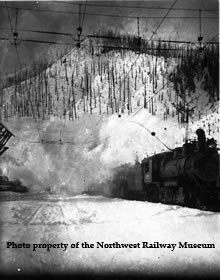 During exceptionally heavy snow, it was common to couple a rotary to each end of a locomotive - sometimes two locomotives coupled back to back - to ensure that snow the blocked the line behind the clearing effort could be cleared too.